On Thursday, come at 3:00pm to the AMCC room (Coffman 236) for an “Amazing Race” style competition, similar to a scavenger hunt. We will be offering a great prize for the team that wins this competition (seriously, it’s pretty awesome). Later in the evening, at 5:00pm, we will be having dinner in the Weisman Art Museum featuring a multicultural cuisine! 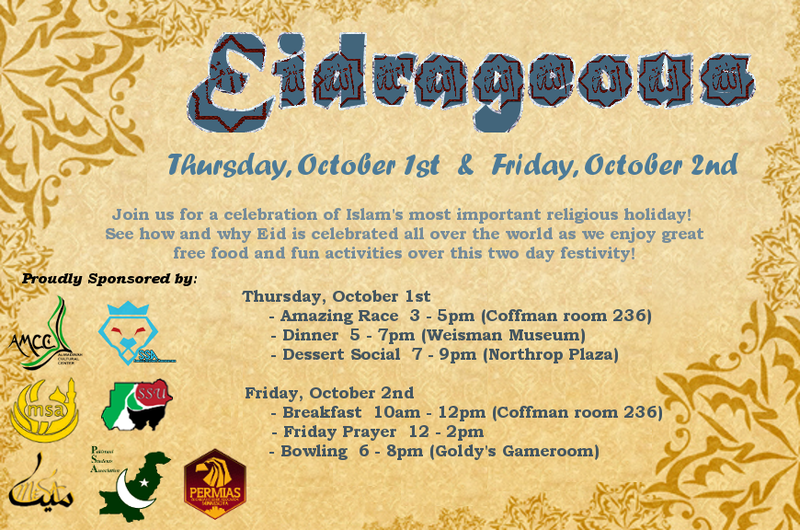 The Muslim Student Association will give a small presentation on the different ways Eid is celebrated around the world. Join us for a delicious meal and good company. Afterwards, we will head to Northrop Plaza for a big multicultural dessert social. Enjoy some tasty treats with friends in the moonlight, with lanterns lighting up the plaza. All our affiliate groups will be offering tasty treats from their region. On Friday, starting at 10:00am, we will be having a breakfast hosted by the Sudanese Student Union, the Middle Eastern Student Association, and the Pakistani Student Association in the AMCC room (CMU 236). Come start your day with a stomach filled with good food. At 2:00pm, join us at the Coffman Front Plaza to play various games with friendly people. Our last event to cap off the week will be sponsored by the Somali Student Association. Join us at Goldy’s Gameroom at 6:00pm for FREE BOWLING, pool, and pizza. You won’t want to miss out on these amazing events, brought to you by all of us! MARK YOUR CALENDARS & INVITE YOUR FRIENDS!